Japanese VIP Tour Agents received a warm reception by Rosie Holidays at the Nadi International Airport on Monday. Rosie Holidays rolled out the red carpet at the Nadi International Airport on Monday as they welcome the first group of selected VIP tour operators from Japan. The welcome was done in conjunction with Fiji Airways and Tourism Fiji. Rosie Holidays general manager Eroni Puamau said the tour operators arrived on Fiji Airways from Hong Kong. “These agents are part of a joint industry effort in promoting Fiji in the Japanese market ahead of the commencement of direct flights with Fiji Airways from July this year,” Mr Puamau said. “These tour operators represent a significant element in marketing and promoting Fiji and their visit is an important step towards showcasing and reassuring them of the diversity of our tourism experiences which they will be enjoying over the next five days of their stay here in Fiji. Mr Puamau added that this was a key part of their strategy to focus on developing the market from Japan and that there would be several more similar visits and activities throughout the year. He said the focus would be on the niche markets of interest from Japan including weddings, diving and other interests. 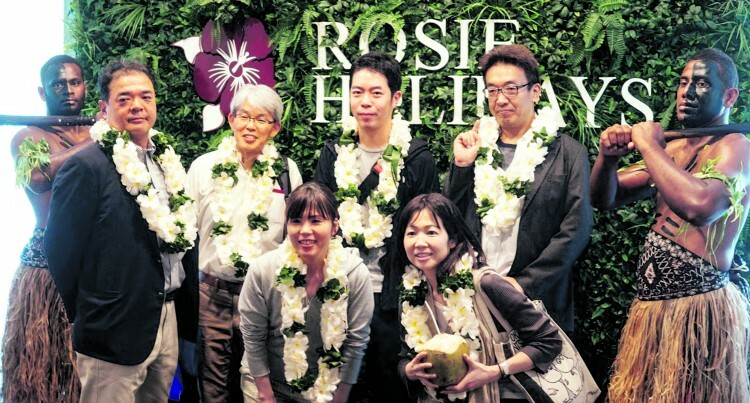 Rosie Holidays has an established presence in Japan through their partnership with local land operators and work closely with Fiji Airways and Tourism Fiji to spearhead their joint marketing efforts in the market. The company is expecting its first chartered flight for this year from China on February 11. The second will arrive on February 17.